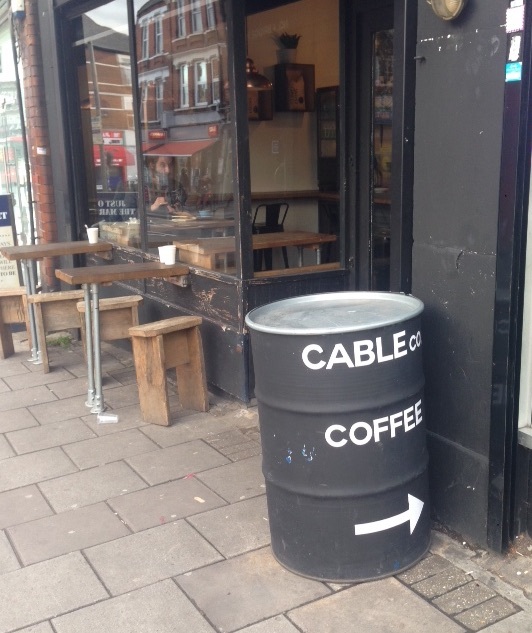 It was fairly late on a February afternoon that we came upon Cable Co on Chamberlayne Road, (opposite Kensal Rise station). With a fairly ‘industrial’ type look, there are plenty of tables at the edge (and in the window) of the café at which to enjoy your coffee. There are also plenty of coffees on offer. Although I had an Americano, I noticed (too late) that pour-overs were available. Coffee is roasted by Climpson and Sons. As it was late in the day, the remaining cakes in the display case all looked to be nutty (or at least likely to be nutty) and so, sadly, I had to wait until I got home for my slice of cake. It was good coffee though, even without the cake, but in a bit of novelty the coffee came ‘deconstructed’, so I got to add the amount of water that I preferred, a nice touch. Golden light from the setting sun streamed in through the windows (which is a navigation clue & tells you which side of the road this café is on). 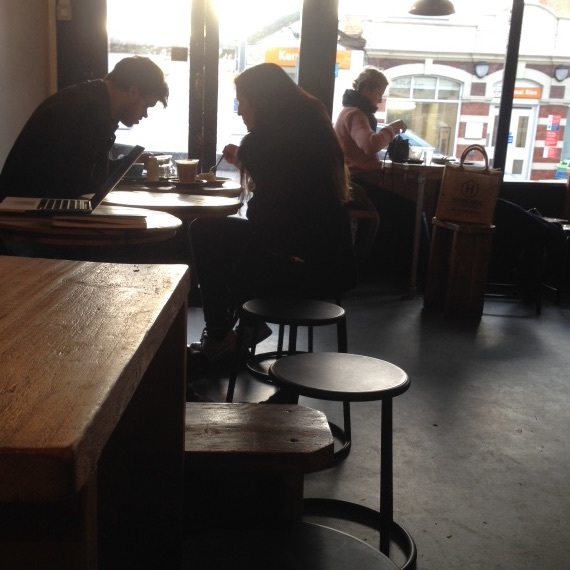 The effect of the Sun was to bathe the café in light and to silhouette our fellow coffee imbibers making the café take on a film-like atmosphere. The light had another effect though. 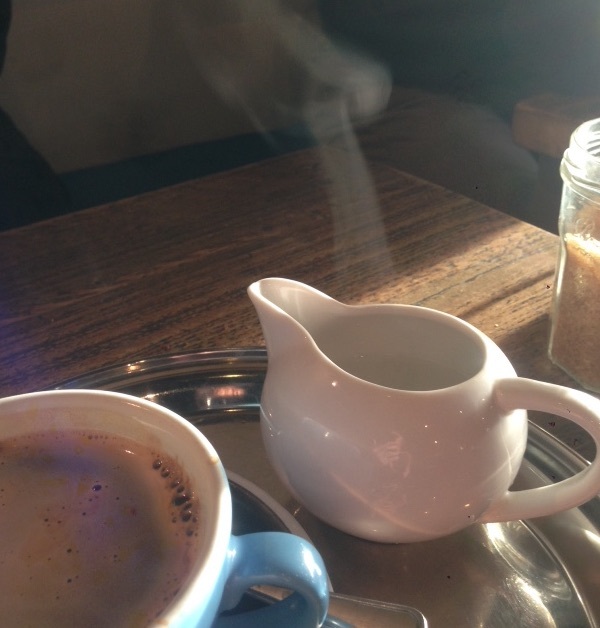 The steam rising from both the jug of water and my espresso became far more visible than it would normally have been. I watched as the steam clouds formed vortices and turbulent patterns, one fluid (steam) moving through another (air). It was very difficult to catch this in a photograph, a fact that I took in support of my idea that it is impossible to catch the beautiful, beauty is necessarily transient (but my companion in these reviews took as evidence in favour of their idea that I really ought to use a “proper”, manual, camera and not my iPhone). Still, those turbulent rising patterns of steam were visible and that implies that light was being scattered from the droplets of water in the steam. The size of the droplets influences the colour that we perceive when we view the steam clouds. If the clouds appear white, it is because the droplets that are scattering the sunlight have a diameter roughly equal to (or greater than) the wavelength of visible light. The wavelength of light varies between about 400 nm (violet) to 700 nm (red) which means that these water droplets have to be at least 700 nm across. To put this in perspective, the smallest particles of coffee in an espresso grind are about 10 μm diameter which is 14 x bigger than the droplets in the steam cloud. Of course, how water droplets scatter light above a steaming coffee has implications for our understanding of why the clouds in the sky appear white (and why the sky is blue). Someone who did a lot of early work in understanding the way that light scattered off water droplets in air was John Tyndall (1820-1893). Tyndall was an experimentalist as well as a famous communicator of science. He regularly gave lectures at the Royal Institution that included demonstrations of the experiments that he himself was working on¹. One of these involved scattering light from water droplets (and therefore demonstrating why he thought the sky was blue). Light streaming into the cafe. The idea is that sunlight scatters from water droplets differently depending on the diameter of the droplet. When the water droplets are approximately the diameter of the wavelength of red light, 700 nm, there is very little wavelength dependence to the light scattering. Practically this means that the droplets will appear white. If on the other hand, the droplets are much smaller than the wavelength of light, the light scattering starts to be wavelength dependent. So as the droplet gets smaller, blue light (short wavelength) gets scattered a lot by the droplets, while red light (long wavelength) is not scattered so much. This means that if you are looking at a cloud of steam formed by these small droplets at an angle between the sunlight and yourself (say, 90º), the cloud will appear to have a blue tinge. If on the other hand you look straight through the cloud at the sunlight coming in, it will have a red-hue because the blue light will have been scattered out of the cloud leaving only the red colours to come through.